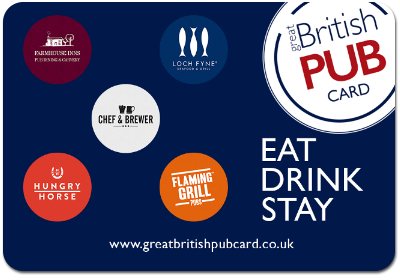 The Great British Pub Card is the leading pub gift card that can be redeemed against food, drink or accommodation in over 3,000 locations nationwide. Including brands such as Chef & Brewer, Loch Fyne, Flaming Grill, Hungry Horse and many others. The Great British Pub Card is flexible and offers a vast choice of food, drink or dining opportunities. Perfect for celebrating those special times with family, catching-up with friends or meeting with colleagues. This card is valid in all Greene King locations. Visit https://www.greeneking.co.uk for a full list of participating pubs and restaurants. For balance visit https://www.showmybalance.com. For full terms and conditions visit http://www.greatbritishpubcard.co.uk/termsandconditions. For card queries please email gpbc@voucherexpress.co.uk or call 0371 384 5931. You must be aged 14 or over to purchase card. Age restrictions may apply to goods/services purchased. Monies on the card cannot be exchanged for cash. Any remaining balance may be used for future purchases. All monies on the card must be used 12 months from date of last use. Any balance will be forfeited. This card may not be exchanged for cash. This card is not a cheque guarantee, credit, debit or charge card. We will not be held liable for lost or stolen cards – protect this as you would cash. Great British Pub reserves the right to amend its terms at any time or withdraw the Card at reasonable notice. Your statutory rights are not affected.